Joan Didion is an iconic American writer, whose work of literary journalism and non-fiction has reflected American moral, social and political complexities over the last fifty years. She’s also written about deeply personal tragedies, including the death of her husband John Gregory Dunne, whose life and death were captured in her award-winning book The Year Of Magical Thinking. Now, at age 83, she is about to be profiled in a new documentary directed and produced by her nephew, the actor Griffin Dunne. The movie, titled “Joan Didion: The Center Will Not Hold,” will premier at the New York Film Festival and will be on Netflix starting in late October. At this late stage in life, Didion, herself a screenwriter, may now acquire fame as the star of her own film. 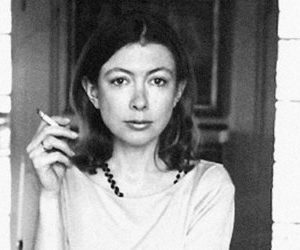 Still tough and yet vulnerable, Didion comes across as complex as any of the subjects she’s tackled. For more about her, read this new Vogue magazine profile Here.